For my mom's birthday- Aunt Pam and I decided to do something a little different. Usually we decorate a cake using all of our Wilton skills (we're taking an official cake decorating class in July), but we decided to do something mom loves just as much- angel food cake. Angel food cake, you would think might be hard to make since it is so sinfully good, but really with a few little tricks it's an easy recipe. However, Grandma, Aunt Pam and I ended up having a couple laughs in the process and also became experts after making 2 batches. Angel food cake take #1- After you take the angel food cake out of the oven you NEED to turn the cake upside down so you keep that fluffy air-light taste to it. Otherwise it will get dense. 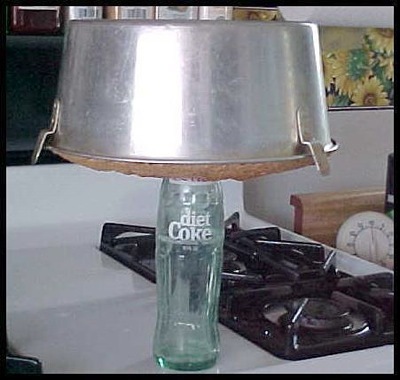 It will resist gravity and not fall out of the pan when you do this- so no worries. When my grandma used to make hers back in the day (as she calls it) she used to rest the pan on top of a glass coke bottle back in the day. We unfortunately didn't think of what we could use until after the cake came out. So we tried a water bottle....That little angel cake went to heaven before we could even get a bite of it! It came crashing down on the floor and the cake smashed into pieces with water spilling everywhere. Aunt Pam was a little sensitive so I decided not to pull a paparazzi moment. At least Nikko the dog got a little snack. Angel food cake take #2!- I had to run to the grocery store and buy more eggs (you'll see on the ingredient list how much you need in one batch!) and try and find a glass coke bottle. Of course- for some reason they were all sold out. However- Grandma and Aunt Pam figured out that we could use the A1 sauce bottle and it worked just as well. It almost fell once- but we were able to catch it just in time. But here are the most important tips and pointers I learned from the Fisher chefs and reading! 1. Apparently- according to a recent Chicago Tribune article on angel food cake you don't have to have it rest on a bottle and really you could just have it slightly raised (put little bowls underneath the sides) and that should do the trick. If this actually works- I will have to see. 2. Angel food cake is one of the healthiest desserts for you! 3. You know you have beaten your eggs right when you can literally turn the bowl upside down and nothing falls out. Aunt Pam performs this "magical" trick. Mix powdered sugar and flour; set aside. Beat egg whites and cream of tartar in large bowl with electric mixer on medium speed until foamy. Beat in granulated sugar, 2 tablespoons at a time, on high speed, adding vanilla, almond extract and salt with the last addition of sugar. Continue beating until stiff and glossy meringue forms. Do not underbeat. Bake 30 to 35 minutes or until cracks feel dry and top springs back when touched lightly. Immediately turn pan upside down onto heatproof funnel or bottle. Let hang about 2 hours or until cake is completely cool. Loosen side of cake with knife or long, metal spatula; remove from pan. Perfect- light fluffy angel food cake. Just a simple bite of heaven. Happy birthday to the best mom in the world.